Bangkok (VNA) – Deputy Minister of Public Security Sen. Lieut. 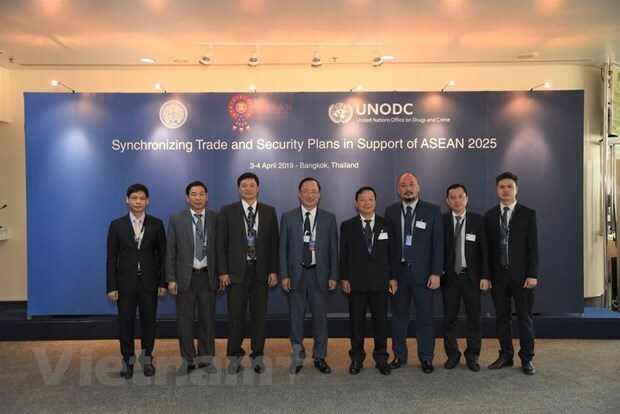 Gen. Nguyen Van Thanh is leading a delegation to attend a high-level regional conference themed “Synchronising Trade and Security Plans in Support of ASEAN 2025” which kicked off in Bangkok on April 3. The two-day event, jointly held by the Thai government and the United Nations Office on Drugs and Crime (UNODC), has attracted the participation of ministers and senior officials from ASEAN member states and several dialogue partners who are expected to discuss issues related to border management in order to handle important security challenges during the region’s economic expansion process. In his opening remarks, Thai Prime Minister Prayut Chan-ocha stressed that over the past few years, Thailand and other regional nations have detected many cases involving drug smuggling and cross-border crimes. Therefore, a common strategy on border protection will help strengthen the stability and security of the region, thus facilitating the development and border trade growth, he stated. Participants agreed that with a total population of nearly 650 million, ASEAN is one of the largest economic communities in the world and that it has carried out a number of initiatives to develop border trade. However, these initiatives can create loopholes for illegal trading and trans-national crime activities, which poses a challenge for ASEAN and its members to build common strategies and mechanisms to solve the issue. Speaking at the event, Thanh appreciated the organisation of the conference. He informed participants of Vietnam’s efforts to ensure security in border areas with ASEAN member states. He said that cross-border crimes, including those related to drug and commodity smuggling, human trafficking, high technology, terrorism, and piracy, are threatening stability and trade, economic and investment development in the region in general and in Vietnam in particular. He stressed the need for ASEAN member countries to coordinate more closely to effectively fight these crimes. The Vietnamese official also made recommendations to control cross-border crimes, such as completing the legal document system, stepping up information sharing, intensifying cooperation with ASEAN’s dialogue partners, and organising workshops to share experience in this field. As an active and responsible member of ASEAN, Vietnam commits to participating in all of the bloc’s cooperation frameworks, including those in trans-national crime prevention and control.